When you try to see yourself in the smooth mirror of water, you see first the sky. A man who tries to see himself in the Bible, as if in a mirror, should first see God (based on James 1:23 and 2 Corinthians 3:18). The twin Psalms 111 and 112 are complete alphabetical, biblical acrostic  compositions. Others of this sort include Psalm 119, Proverbs 31:10-31, and Lamentations 1. Authors of biblical poetry sometimes adapted this poetic form,  but in a pure form it was preserved nowhere else except in these few mentioned places. Psalms 111 and 112 also bear a twin resemblance creating a parallel diptych — part one praising God, and part two describing the happiness of a man living in friendship with God. The acrostic of these two psalms is unique. In other alphabetical forms, successive letters of the alphabet begin whole verses, or groups of verses. Only in these two psalms do successive letters of the alphabet begin parallel stiches of verses. Ten verses of both psalms contain twenty-two stiches which begin with successive Hebrew letters. Each of the first eight verses is divided into two stiches, and the last two have three stiches. It is difficult to say if the author of these two poems is the same person. Perhaps the harmonious form of Psalm 111, which praises God, was copied in Psalm 112 by a different author who, in similar verses, wanted to characterize the figure of a devout man. Also, we do not know when the Psalms were organized into one book, or who did it, giving to the poems under discussion positions 111 and 112. According to Hebrew tradition, the Hebrew Bible was codified by Ezra after the Babylonian captivity. He, too, was an inspired Biblical author. Possibly he expressed a divinely inspired meaning through the form of the book and the succession of the psalms. 22 Letters. The Hebrew alphabet contains twenty-two letters. This number appears also in the description of the golden lampstand in the Tabernacle. The lampstand contained three almond shaped cups in each of six stems, three stems on one side, and three stems on the other side. 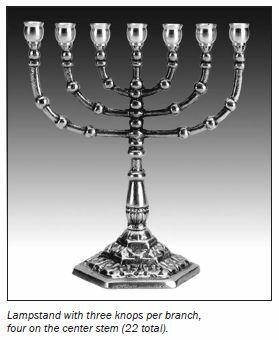 The middle stem of the lampstand had four almond shaped cups (Exodus 25:33,34). Thus, altogether, there were 22 such cups. These three levels of tens of alphabetical symbols are connected in the Hebrew symbolism of numbers with three levels of time. Depending on the context, these are: future, present, and past; or youth, maturity, and old age. On all these levels, God should be, for man, always number one. 10 Verses. The division of Hebrew text into verses (unlike the division into chapters) is original and can be seen in antique records. Both Psalm 111 and Psalm 112 are divided into 10 verses. Number 10 is, among other things, an expression of human symmetry. We have two hands, two feet, and five digits on each. It may be that the number of fingers is a foundation of the decimal system. Ten, in accord with the above symbolism, expresses the priority of God in the present, or in maturity. Ten is recorded with the letter Jod,  the first letter of the name of God. The remaining letters of his name are He-Waw-He, or 5-6-5. Structure 9+9+4. Just as the Hebrew alphabet is divided, according to number meaning, into three groups — 9, 9, and 4 letters — so in Psalms 111 and 112 we can differentiate three such groups of meaning, placed exactly in such a number of stiches. In the first nine stitches of Psalm 111 (verses 1-5a), God’s greatness is praised. The middle of verse 5 begins nine stiches about God’s Covenant with His people. In the last four stitches (verses 9c-10), God is presented as worthy of admiration and reverential fear, which makes godly people wise. In the first nine stiches of the parallel Psalm 112, there is a description of the virtues and the happiness of a godly man. In the next nine stiches, his positive relationships with neighbors are described. The last four stiches express powerless anger and jealousy of the wicked. While fear (respect) of God brings positive results, such as growing in wisdom, the evil of the wicked man makes him waste away and his desires perish. Even though evil is destructive, the final result is positive, for what is evil and unworthy of lasting, passes away. Reading the parallel stiches of both psalms, it is easy to notice that many of them are thematically close. The best example is in stich 3a, which starts with the letter Waw: “and his righteousness endureth for ever.” These words sound identical in both psalms, the one applying to God, and the other to the godly man. This symmetry shows that the righteous man reflects with his life the glory of God, thus bringing honor to God among people. Looking at the other side, one needs to learn godliness from the Lord God, by observing and following examples from His attributes and His works. Knowing and giving praise to God, as well as showing Him respect by following His example, develops godliness. The Lord God undoubtedly takes pleasure in observing the reflection of His glory on earth. Alef-Teth. Psalm 111 starts with the words of the righteous man who desires to give praise to God in the assembly of the upright. Psalm 112 begins where Psalm 111 ends. The fear of God is the beginning of wisdom, and the man who fears God is happy and worthy of a praising psalm. A symmetrical parallelism for “the works of the LORD which are great,” from Psalm 111:2a, is in the life of the righteous man, the blessings for his descendants (Psalm 112:2a). The glory and the majesty of God’s works (111:3a) are reflected in the spiritual and material wealth and the riches of the man who fears God. The equivalent of the remembrance of God’s wonders (111:4a), in the life of the righteous, is light. To the grace and mercy of God, in the life of the godly, is added uprightness. This points out the necessity of keeping balance in showing mercy and gentleness. The first passage of 10 stiches ends with a statement that the Lord feeds those that fear Him (111:5a), while the man who fears God shows compassion and lends to those in need. Jod-Tsade. In the second part of Psalm 111, the most prevalent idea is the covenant of God with His people. The equivalent of this in Psalm 112 is the righteous man’s ability to treat his neighbors well. His actions are a practical application of God’s righteousness shown in the Law. The symmetry of this passage is not as exact as in part one. Instead, the symmetry is directed along separate paths. The Lord in His eternal covenant has guaranteed His people the stability of His mercy and blessings. The righteous man, on the other hand, aptly puts into practice the decrees of God’s Law. The result is a good reputation, stable position in the fellowship of God’s people, and control over the actions of the enemy. The righteous man looks at them “from above” in the sense of an ability to foresee their evil desires, and not in the sense of looking down upon them. Most important is the ability to rescue the poor from their troubles, a reflection of the saving power of God (112:9a). As the Covenant with God is everlasting, so the righteousness of the godly man will endure forever. Qof-Taw. The last four stitches of Psalm 111 express an idea that the Lord is worthy of respect, awe and even fear, and those who act according to such respect gain wisdom. In the corresponding parts of Psalm 112 the position of the godly man is so strong among his fellowship that the ungodly can only be angry and gnash with his teeth. The ungodly will wither and waste away, and his desires will perish. The glory of God will endure forever (112:10c), while the longings of the evil-minded man quickly fade and pass away. The believer who reads Psalm 111 has no doubt that God is worthy of admiration and praise. However, some statements in Psalm 112 about the righteous man may raise doubts. It may appear that our experience differs from that expressed in the psalm. Often the godly man is not respected by his people and sometimes he is persecuted. He may suffer illness or poverty. His enemies look down upon him more often than he does upon them. There can be no doubt that the attitude described in Psalm 112 is worthy of the Lord’s praise and will be rewarded in the Kingdom. But is it true today that the righteous man is rich, happy, and respected in the midst of his neighbors? This text, like many other passages of wisdom literature, encourages one to develop attitudes pleasing to God, even if they are not popular. By showing in symmetrical verses the similarity between man and God, the inspired author encourages the reader to actions that please God. But pleasing God will not always result in earthly advantages in the present time. The greatest goal in a human life is to become transformed into the likeness of God, by recognizing His glory, developing respect for His holiness, and learning practical ways of following God’s Law. Through such actions a person can achieve what we all desire most — happiness — a feeling of harmony with God and all His creation. The Christian reader of Psalm 111 may also be astonished at the statements of the eternity of God’s covenant with Israel and the steadfastness of the Law. “All His commandments are sure. They stand fast forever and ever.” “He hath commanded His covenant forever” (verses 8,9). Theological opinions, grounded in centuries of Christianity, may prompt a Christian to think that truth is relative, or conditional. According to many Christians it seems that the Sinai Covenant has lost its importance. The inspired author of the Psalms leaves no space for such doubts. As today a godly man is not always happy, similarly God’s covenant is not always respected. Still, the final messianic continuation of the Sinai covenant, and the transfer of God’s eternal law into the hearts of all people, will guarantee the eternity of these decrees of God and will spread them finally to the whole of mankind. When God’s law and His covenant, which began with Abraham and continued through Moses and Christ Jesus, will be in force, then happiness will belong to all people. Then all will fear God and obey His commandments. The Hebrew word jirah, used in this expression (and in Proverbs 1:7), is connected more with admiration, than with fear. It describes the awe which arises when we look at magnificent mountains that are dangerously close, or when we hear an avalanche falling in a distance, or the roar of a huge waterfall overhead. The feeling of jirah appears during a storm in the time between lightning and thunder. Even if we are in a safe place, we experience a mixture of fear and admiration for the magnificence of nature. This kind of “fear” puts your being in touch with a phenomenon that is incomprehensible, immeasurable, beyond human knowledge and even imagination. Such a beautiful, positive feeling of “being stunned” is also felt when we look up at the endlessness of the starry sky. The Lord God appeared to Israel on a high mountain, in the middle of the sounds of a storm. He anchored his promise to Abraham in the stars of heaven. Our Heavenly Father does not want us to tremble with fear before him. He wants us to admire him and to feel a due respect, because such feelings prepare us emotionally to acquire the proper wisdom of God. The ending of Psalm 112, corresponding to the passage about the fear of God in Psalm 111, brings forth another troublesome thought for the Christian reader. The upright man prospers and his enemy wastes away. Who of us would rejoice at his own happiness while other people waste away and perish? Of course, there are some who are excited at the thought of someone else’s misery, but this surely is not what the author of the psalm had in mind. In many psalms we read of curses and prayers for the misfortune of the enemies of God and his chosen. The feelings that arise at such readings should have nothing to do with revenge, or joy at someone’s misfortune. The upright man carefully cultivates good but he also takes care to uproot evil. In this sense, the wasting away of the wicked desires does not bring misery for your neighbor but general gains for individuals. Seeing uprightness, the wicked man gnashes his teeth for a while. One day these feelings will melt away. The upright, on the other hand, rejoices when goodness, love and truth triumph. While comparing ourselves to the image of God’s glory mirrored in Psalm 112, we discern that the image we behold is impossible to attain. Yet, no other ideal but perfection is worthy of imitation by God’s chosen ones. “Be ye therefore perfect” Jesus taught us (Matthew 5:48). It is not profitable to grieve over your inability to realize the ideal. Better to climb slowly towards unreachable summits. The Lord opens the gates of eternity before the godly man, and the vision he beholds allows him to reach out even today for the ideals of perfection without end. Such is the encouragement that we find in the double acrostics of Psalms 111 and 112. Glory to the Highest, Hallelu-Jah! May happiness be a frequent guest in the life of the righteous man. Amen. (2) A biblical alphabetical acrostic is a poetic form in which a verse, or its parts, or clusters of verses, begin with successive letters of the Hebrew alphabet. (3) In Hebrew poetry, parallelism consists in keeping logical links between parts of verses, based on similarity, contrasts or development. 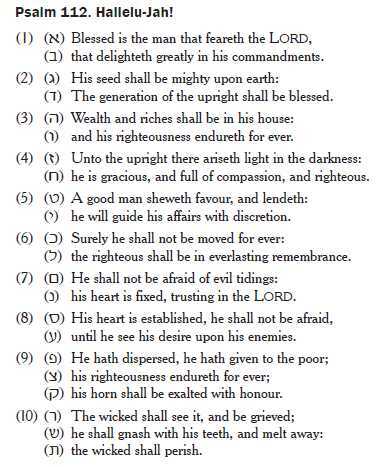 (4) Other acrostics are Psalms 34, 37, maybe 25, Psalm 145, and Lamentations 2, 3, and 4 (editor). (5) A similar form can be found in the first chapter of Nahum. In that chapter, however, it does not have such a regularity, and it stops with the 13th or 15th letter. (6) Stich: a half or third of a verse, formally marked as a separate whole. In Psalms 111 and 112, each of the 22 stitches in each psalm begins with a consecutive letter of the Hebrew alphabet, which has 22 letters. 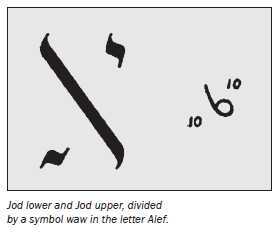 (7) The Hebrew word elef (thousand) is written with exactly the same Hebrew characters as the name of the first letter, Alef. (8) Jod means “hand.” Kaph might mean “palm of the hand” (editor). (9) The depiction shown is the Aramaic form of script; the early form seen in the Dead Sea Scroll from the first half of the 1st century looks a bit more like N. The original aleph was an upside-down A, which looks like the head of an ox, or bull, or bullock — Editor.